Worn Free is a vintage rock and roll T-shirt company with a simple mission: to resurrect the coolest shirts of all time by reproducing original t-shirts worn by musicians, now including Sting! The tag inside each of the 4 shirts now available resembles a backstage pass and features a photo of Sting wearing the original shirt, plus information documenting the date and venue. This is more interesting than the news of another tour! I wish they would re-create the lavender labyrinth shirt! That I would buy! 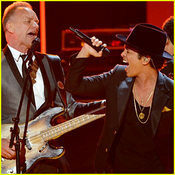 During the tribute to reggae legend ; Bob Marley 2013 Grammy Awards, you may have heard echoes of Sting's former band the Police in Bruno Mars' soul-soaked "Locked Out of Heaven" - the syncopated chirps and the frenetic sonic echoes of Synchronicity are shamelessly (and addictively) shot throughout the song. And Mars has even called himself out on the fact that the explosive song owes its musical roots to the Police. "I grew up listening to the Police. I grew up performing in bars, singing Police songs," Bruno told MTV News in 2012. "I remember performing a song like 'Roxanne,' and you play those first couple of chords, and you hit that first note, and you watch the whole bar ignite..."